Web.com—How Do I View My Current List of Support Tickets? In your Account Manager, you can easily view how many support tickets you have in your list. 2. 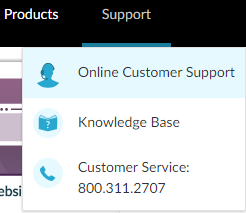 In the main toolbar, click the Support menu. Then select the Online Customer Support option. 3. On the Support page, review the tickets that appear in your list. 4. Or, in the search bar, enter a keyword, comment, or ticket number. Press Enter on your keyboard or click the Search icon to return the tickets that are currently being worked. Note: Check the Status column to review the progress being made on your ticket. You have viewed your current list of support tickets. Web.com—How Do I Create and Submit a Support Ticket?